There are many things in the pipeline to be discussed on AAK! -- like the 50 most influential K-pop project, the upcoming World Cup or a litany of really interesting questions -- but right now, any discussion other than the biggest news coming out of Korea feels frivolous. 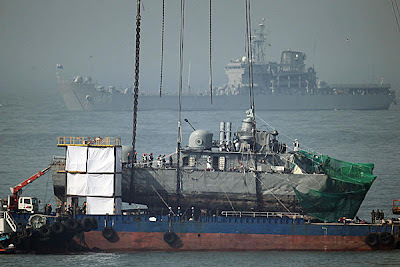 The Korean, of course, is talking about the sinking of ROKS Cheonan. North Korea is not an easy topic to discuss. The history of inter-Korea relation is long and complicated, but not knowing that history deprives one of the context that one must know to properly assess the situation at hand. Worse, the topic of North Korea is highly emotionally charged on nearly every aspect, which makes the tone of the discussion shrill, hyperbolic and ultimately unhelpful. In discussions about North Korea, commentators often do not think seriously about the consequences, but instead focus on delivering zingers that feels good to say but are wildly implausible and/or extremely dangerous. More importantly, North Korea is a topic for which the Korean simply cannot give an answer. Many people far more brilliant and knowledgeable than the Korean have searched for an answer, but none has borne fruit. Thus, the Korean prepared a simplified, two-part dossier on this issue. First part will be the basic information that everyone should know in thinking about how to assess the ROKS Cheonan issue, and the second part consists of the relevant questions that we should be asking ourselves in thinking about this issue. Here are the basic facts. On March 26 of this year, ROKS Cheonan -- named after the city in Korea -- split in half and sank nearly instantly. Forty-six sailors died or went missing. After an international investigation, it has been more or less confirmed that Cheonan was attacked by a torpedo fired from a North Korean submarine. North Korea is vigorously denying the accusations, but at this point there appears to be no other possible culprit. The critical piece of evidence was a remainder of a propeller for a torpedo, which carried Korean lettering. The attack on the Cheonan is the largest-scale attack by North Korea since the late 1980s. Up to late 1980s, North Korea was quite bold in its attempts for terrorism/military action. For example, in 1968 thirty-one North Korean commandos infiltrated Seoul and unsuccessfully attacked the presidential residence, killing many in the process. In 1974, a North Korean assassin fired at the South Korean president during a public address, but only managed to kill the First Lady. In 1983, North Korean spies bombed the South Korean president and his entourage in Myanmar, killing 21 including the Vice Prime Minister. In 1987 North Korean spies left a time bomb on a South Korean airliner which later detonated over the Indian Ocean, killing all 115 aboard. But from the 1990s and beyond, North Korea was relatively quiet. While there were intermittent episodes of significant saber-rattling -- culminating in North Korea's threat of developing nuclear weapon a few years ago -- a deliberate military strike like this one simply did not happen in the last 20 years or so. The closest analogue would be the two naval skirmishes in 1999 and 2002, in which North and South Korean exchanged fire in the sea just south of the Northern Limit Line, which divides the North and the South. But the attack on the Cheonan is significantly different from those skirmishes. It is true that those naval skirmishes resulted in some casualties and a loss of a ship -- in 2002, South Korea lost six sailors and a gunboat. But in the end, South Korea was easily victorious in the two naval skirmishes by any objective indication. Also, while nothing about the war should be stated cavalierly, the two naval skirmishes were essentially fair fights. North Korean navy provoked South Korean navy, South Korean navy responded and emerged victorious after a battle (although not without some damage.) In contrast, many more died on Cheonan, a more significant ship than a gunboat. More importantly, this was a surprise attack with no forewarning, instead of an outright provocation leading to a battle. North Korea internally is going through a significant change. The long-time despot Kim Jong-Il is in ill health, and a three-generation succession is a hard sell even in North Korea. Also, what little we know about the announced heir, Kim Jong-Un, does not bode well. The younger Kim is only 27 years old and is apparently fond of shooting things, having majored artillery in Kim Il-Sung University. Recently, North Korea instituted a currency reform which ended in a disaster, causing runaway inflation and severe disruption of food supply. In a rare gesture, North Korean regime even apologized to its people for the abysmal failure of the currency reform. It is fair to think that the internal instability is connected to this attack. Often, North Korea uses an external threat (that is self-generated unbeknownst to its people) as an excuse to crack down on its people, and this attack could be a part of such a plan. Also, recent inter-Korea relations have been chilly at best. The last two administrations of Korea were pro-engagement toward North Korea, which over time became fairly unpopular among South Koreans. The current Lee Myung-Bak administration won the election with an explicit promise of taking a harder line against the North. So far Lee has stood firm on his promise, significantly reducing South Korea's aid toward North Korea. On May 23, Lee administration unveiled the sanction plans against North Korea in response. South Korea will stop all economic aid to North Korea, except for aid aimed toward infants and children. South Korea will also significantly reduce the economic exchange program currently in place. Also, North Korean ships are no longer allowed to pass through South Korean waters. (Previously, the two Koreas had a treaty whereby airplanes and ships could pass through each other's territorial air and waters.) South Korea will resume the propaganda broadcast toward the North, and stated that in case of a naval provocation by the North, South Korea will annihilate the naval base from which the North Korean ship left. In response, North Korea announced that it will cut off all communications with South Korea, including the Red Cross Communications Representative at Panmunjeom that had been operational for 39 years. It is also making overtures of further provocations/attacks. These measures essentially amount to reverting back to the Cold War posture between the two Koreas. United States, through Secretary of State Hillary Clinton, is exploring ways to sanction North Korea. In particular, Clinton is asking China to intervene. Japan is also considering a sanction. UN Securities Council may be called upon to act as well, which will ratchet up the sanctions further. With this information, here are some questions to think about. - Will North Korea attempt this type of attack again? For better or for worse, North Korea's actions in the last 20 years or so were predictable. It is a mistake to think that Kim Jong-Il is a madman who will fire nuclear missile for shits and giggles. He is a calculating politician who is interested in exactly one thing and one thing only: the survival of the regime, and by extension, continued enjoyment of his power. Also, if there should be a full-scale war between the two Koreas, there is no doubt as to the eventual outcome -- South Korea will emerge victorious. In fact, Kim Jong-Il knows that the beginning of a full-scale war is equivalent to his annihilation within minutes. Then the fact that North Korea would engage in this type of attack, raising the possibility of a full-scale war, is counter-intuitive. Even if North Korea needed a rise in tension for internal reasons, North Korea has been able to do so without necessarily causing casualty -- for example, by testing a nuclear weapon. And this is the most worrisome aspect of this attack -- that the North Korean regime is no longer predictable. North Korean regime has talked big, but rarely followed through in an actual attack like this one. (For example, in 1994 North Korea famously announced that it will turn Seoul into a "sea of flames". No real action followed.) But now, things have changed, and no one knows how the situation will progress. - Will South Korea's response be enough to deter this type of attack from happening again? Withdrawal of the aid and the economic exchange program is unlikely to mean anything to the North Korean regime. Recall that Kim Jong-Il regime did not even flinch while millions died of starvation in North Korea in the early 1990s. While it does hurt North Korea's pocketbook, Kim Jong-Il's personal pocketbook will not be significantly affected. It is not clear as of yet if South Korea's new resolution to fully retaliate whenever this type of attack happens again can deter such an attack. 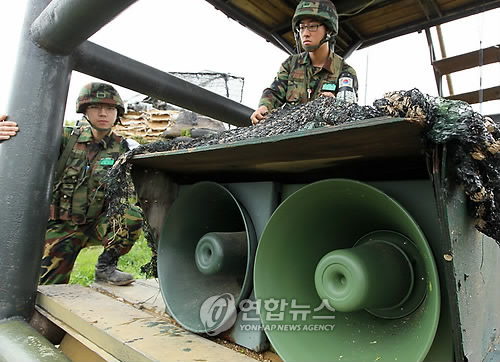 North Korea announced that it will attack any propaganda broadcast speakers set up in the South. South Korea responded that if they are attacked, it will retaliate accordingly. But it remains to be seen how much tolerance South Korean administration for the tension and the increased chance of a full-scale war that will inevitably follow such a retaliation. - Is there anything else South Korea can do to deter this type of attack from happening again? If the North Korean regime only cares about its survival, the only possible response by which South Korea can gain leverage is to threaten the survival of the regime. To this end, Mr. Joo Seong-Ha recommended improved intelligence on where Kim Jong-Il is at all times, and at least three stealth bombers that can be used to immediately kill Kim Jong-Il. But no matter how broad (e.g. full-scale war) or narrow (e.g. targeted assassination of Kim Jong-Il) the response is, South Korea must back the response with the gumption that a full-scale war might actually occur. For now, South Korea is responding by creating as much disruption without a military response, i.e. propaganda broadcasting. As discussed earlier, North Korea is reacting strongly even to this. While the second Korean War will almost certainly end in the South's victory, the central dilemma for South Korea has been the same for the last 40 years -- Seoul, the nation's capital with the population of 10 million people in its metropolitan area, is only 30 miles away from the DMZ. Along the DMZ, North Korea has a number of long-range artillery and missiles aimed at Seoul. Should North Korea decide to fire them, there is no way for South Korea to completely intercept them. Should North Korea decide to wage war, Seoul must endure at least one or two rounds of missiles and artillery shells raining down on Seoul before South Korean and American air forces and take out the missiles and cannons. Thousands will surely die -- and we did not even get into the economic loss that South Korea will suffer. This is the dilemma that makes South Korea hesitate to even think about the possibility of a full-scale war, especially because most policymakers of South Korea personally remember the devastation following Korean War. This really is the bottom line for South Korea -- is it willing to gamble on the full-scale war? - Is there anything anyone else can do to deter this type of attack again? There is not much the U.S. can do, other than urging other countries to fall in line and sanction North Korea. Japan's sanction can be a little more effective, because pro-North Korea Korean-Japanese in Japan are known to send money and goods to North Korea. But ultimately sanctions from Japan will not amount to much effect either. One can hope that China will realize that the inter-Korea relations have changed dramatically since it formed its friendship with North Korea. In the sixty years following Korean War, South Korea has unequivocally won the race of proving which one of the two Koreas was better. Partnership with South Korea is becoming increasingly valuable for China, while partnership with North Korea is becoming increasingly worthless. At some point, the balance may shift and China may throw its support behind South Korea. But it is unlikely that China is ready to do that as of now. - What does this mean for the reunification of the two Koreas? There is much debate on this issue, but at the end of the day, no one knows. On one hand, this may drive the South Korean people to antagonize North Korea further such that they would no longer support, or actively oppose, reunification efforts. On the other hand, if we are to accept that reunification can happen only if the Kim Jong-Il regime disappears, this attack may serve as the catalyst for serious destabilization efforts -- despite the risk of war -- to begin. Even a brief look through it should provide a very good idea of what KJI is currently doing and why he's doing it, in my opinion. I think you are correct in assuming that this attack is related to internal North Korean politics. I would guess it is a distraction from the botched currency reform and subsequent unrest, and connected to the succession issue. To speculate wildly without any supporting evidence, I suspect that it's Kim Jong Eun (Little Kim) who is behind it. The boy needs some sort of military success to prove his salt to the old generals who would have to take his marching orders in the near future. What better way than to sink a warship of the southern traitors? Think about what his old man did in the '80s when he was in the same position. Fat Boy is assumed to have been behind the bombing of the KAL jet and the trade delegation in Rangoon. Not exactly military strikes but blows against Seoul government that could have been spun as military action to satisfy skeptical comrades of Kim Il Sung. Are we seeing the same thing again? Who knows. Sanctions don't hurt the regime, they hurt the people. They simply don't work. I can't see that there is any way to deal with the situation. This proves that KDJ's Sunshine Policy, although not popular by general consensus in SK, was effective eliminating provocations from NK. A rogue regime such as KJI doesnt have an ounce of interest of take care of its people, as true root of socialism is. It is, however, used as a tool by KJI to sustain the interest of his family and cronies within the government. I just got done finishing My Soul by Kim Hun Hee, the infamous memoir of KAL bomber in 1989. The jest of the book is that we as humans can be conditionally trained to believe what we are only told to be the TRUTH only if that is what we are exposed to. And KJIs regime is a mastermind behind such a systemic, psychological indoctrination. I just wanted to start off and say that I enjoy reading your blog, even though I sometimes disagree with your views on certain issues. I hope you don't take offense at the following; my posting is sincere and I hope to get some perspective of some thoughts I've had about this whole issue. What do you think of talk that S. Korea has falsely accused N. Korea of the attack? I know conspiracy theories tend to emerge from these sorts of happenings, but why deny N. Korean researchers a chance to contribute to/conduct an investigation? And also, I've heard the contrary to what you said about "annihilation within minutes." Supposedly, if the two countries were to clash, it would result in a long, drawn-out, casualty-heavy battle. North Korea may have millions of soldiers, but their technology is antiquated. South Korea could easily crush the North if war were to break out, especially with U.S. help. Bombers can turn Pyeongyang into rubble in minutes. I disagree with your assessment, especially where you insinuate the battle between North and South Korea will be a long and drawn out affair. I believe NK against SK will not win in any conventional warfare, but it will be a very quick defeat to SK. And I would go further to state that NK soldiers may even emulate Iraqi soldiers during the USA's war against Iraq where they will put up a fight during the early phases of the battle, but concede as soon as possible. As far as rejecting a team of NK researchers to perform the root cause of to the sinking ship. Are you serious? This dysfunctional govt country has no credibility to perform such critical assessment. Because of the gravity of the blast -- it killed 46 soldiers -- the investigation requires honesty, fair, and expert assessments from various constituents where they will be as objective and balanced as possible. And if you are familiar with NK, fair, objective, honesty, balanced are words not synonymous with the NK's regime. If, however, NK is allowed to perform their own investigations will not only be irrationally nonobjective, it will also provide a platform to which NK can counterclaim SK and USA's investigations to use as another propaganda against SK, further destabilizing the region. Your assertion that NK should be allowed to conduct their investigation to sinking of the ship is just plain ludicrous. Believe it or not, I actually thought the same way you did. After speaking to someone who is quite knowledgeable of the situation not only with regards military matters in general, but also with the conflict here in Korea, I was assured that this wasn't the case. Unless you're either an expert on these matters, work for the military (or something to the same effect), have insider info or proof, etc. to back up your claim, I'm not compelled to continue believing this notion. With regards to letting NK investigate, I understand why you feel that way, and it makes sense. The question wasn't something I personally posed or even thought about myself, but rather something I came across while reading about this whole situation. That being said, the issue I wanted to raise, after reading some others' thoughts and questions about this situation, was not whether or not NK was allowed to do it's own investigation. It was this: why not let NK take part of the investigation procedure, as in, along with everyone else? Especially if they were willing? Where's the harm in it? If they were to be totally off-base, there'd be no problem in kicking them off of the investigation. It's not like they'd be doing it independently; no one in their right mind would allow that. Oh, and I personally wasn't implying that the battle would turn out that way. I was just relaying information I had learned from a more credible source than myself, and how it challenges the popularly accepted notion of a swift outcome. LOL! Hey Joshua, why not ask mafia Dons to help during a criminal investigations into mafia crimes? I'm sure they are very willing. If it turns out that they tampered with the evidence or mislead the investigation then they could just be kicked out right? Wheres the harm in it? It's not like they'd be doing it independently; no one in their right mind would allow that. If they are not fit to do an investigation independently there is a reason for it and if you can't handle an investigation by your self why make you think you deserve to be on a team of investigators? NK is more then welcome to look at the evidence provided and disprove it. But isn't it funny how instead of doing that they immediately issued threats? Riight so you are saying investigations by the USA, UK and Europe are going to be fair and impartial? What is your basis for this? Remember in 2003 the UK and USA FABRICATED evidence to attack and country (Iraq) to steal its oil. Note South Korea and Tony Blair are complicit in this as Tony Blair signed an agreement with a SK company to murder 1000s for oil. Or the way Afghanistan's government said no to an gas pipeline in 1999, and yet conveniently the first thing that happened when the puppet government of Afghanistan was installed was to agree to a gas pipe line through Afganistan. Therefore the USA and Europe already have negative character marks against them. So why should you trust their 'fair and impartial' investigation? If anything their record of fabricating evidence makes their investigations incredibly unreliable and therefore not to be trusted at all. I'm not saying this is exclusive to Western powers, just people should take a pinch of salt in all this and not swallow hook line and sinker as well as copy of angling times what your government tells you. Riight, and Iraq and Afghanistan were supposed to be cake walks too right? You do realise Seoul's phenominal population density is a huge advantage for NK's 20kt A bombs granted A bombs are not really powerful compared to thermonuclear bombs but an A bomb landing at Yi Sun-sin statue's feet would kind of ruin my day a great deal. So your implying that the investigation is crooked? Wheres your proof smart guy? By the way, the United States, Australia, Britain and Sweden were part of the investigation. I'm having trouble trying to imagine the Swedes as war mongers. What do any of them have to gain from the blame placed on NK? The DOW jones and the Korean won dropped heavily due to the instability in Korea. Considering that the US is already heavily involved in two wars right now, why would it want a third? I also noticed you trotting out the old saw about blood for oil. So just how much oil does NK have and why aren't they using these phantom oil fields to get rich like Iran? If 'the USA and Europe already have negative character marks against them' then please enlighten me on the pristine character marks of China and North Korea. As I wrote earlier, NK will have plenty of time to question the evidence at the UN. As for the wars in Iraq and Afghanistan being cakewalks, the actual wars were cakewalks. Its the peace following the wars that have been an ongoing nightmare. By the way nobody who knows anything about the NK military thinks it would be a cakewalk. Did you actually read my post or come to conclusions before finishing it? "I'm not saying this is exclusive to Western powers, just people should take a pinch of salt in all this and not swallow hook line and sinker as well as copy of angling times what your government tells you." And FYI I never said China or North Korea were pristine either, but it is not mutually exclusive as you put it i.e. black and white. There are shades of grey, so while China is probably closer to the black than the white, this does not mean the USA is pure white either. So the expert said that they find pieces of a North Korean torpedo. But how did they find out that it was launched by a Nkorea sub? I read that it's a Torpedo Nkorea exports, so I guess it's not something hard to get, is it? What about the inscription what does it prove? Yes I read your post. I took issue with the examples you provided because I felt like comparing them to the situation in Korea was like comparing apples and oranges for the reasons I wrote. There are shades of grey, so while China is probably closer to the black than the white, this does not mean the USA is pure white either. For the record, I think China's position has been just to urge calm. I don't think that it has exactly jumped to NK's defense. I'm not really interested in painting the Chinese government or any other as black, white or grey. I'm not trying to draw a line in the sand, but if things like 'yellow cake', 'Fahrenheit 9/11' and such were trotted out every time the government tried to make an assertion then I think that it would create a lot of undue prejudice. I will however acknowledge that 2010 really does seem to be a banner year for anti-government and anti-corporate establishment sentiment all over the world. What do you think of talk that S. Korea has falsely accused N. Korea of the attack? The Korean thinks it is groundless. Actually, when the Korean said "Kim Jong-Il knows that the beginning of a full-scale war is equivalent to his annihilation within minutes[,]" the Korean's point was that KJI's personal annihilation will be within minutes. You are correct that the second Korean War could possibly be a drawn-out affair, depending on how much NK military will resist. To all the naysayers, I'm going to still stand by what I said. South Korea, with American assistance, and with nobody assisting the North Koreans would easily crush North Korea. That doesn't mean that it will be a pretty short term war with few casualties. You'd probably see the end of Seoul as we know it, as NK artillery would basically turn it into a giant inferno. But when all is said and done, the South would come out on top, and it would be the end of the northern regime. Afghanistan and Iraq are totally different from NK. They are a foreign power coming in, basically colonizing the country and with no clear objective. Osama bin Laden is a small carrot being dangled in front of Americans' noses, as there isn't any real effort to find him, or even worse, they've already found him, or they know he's already dead, but they let the American public think he's alive so that they can continue the war with Osama's capture used as an objective that they tell to the people. In contrast, Korea is a divided nation, and South Koreans taking over the North isn't quite the same situation. There's also the prospect of mass surrender by NK troops, which is definitely a possibility. Of course, due to the catastrophic effects that even a peaceful reunification would have on the Korean economy, nobody really wants to even think of a military action to unify Korea. I just don't think NK could stand up and fight for very long, especially without aid from another country. I was wondering if you had any insight as to what the people of South Korea want to be done? From what I can gather (which honestly isn't much), this is a very very big deal to them and they want to see NK pay for its actions. But it also seems to me that they don't wish to go to war. If sanctions won't really do anything to deter Kim Jong-Il himself, what else can be done? I wish that South Korea could wipe out NK's communist regime and basically reunite the Koreas once again. I've heard so much about the families that were ripped apart and I feel for all of the poor citizens who I feel are essentially trapped in North Korea. It is for this reason that I find myself almost hoping there might be a war. But at the same time, I am generally very anti-war and I'm afraid of the repercussions for South Korea. After all, who am I to say another country should go to war, anyway? That's why I was also wondering what you think would happen to SK if war did happen. Would Seoul really be destroyed? Do you think many soldiers would die? Would the Korean economy take a great hit? And do you think that Korea would be better off or worse off afterwards? I'm really concerned about this whole situation but I don't know what would be best for the people of Korea. 1. What do the people of Korea want to happen? 2. If the Koreas did go to war, how do you think SK would be affected after? Sorry if these questions are completely stupid, btw. And thanks for your post! If there were a reunification it would be done like Hong Kong and Macau. They wouldn't join up and would keep the states separate. This would make Korean corporations very happy. At risk of sounding like a marxist. A lot of people ask so what has NK got we want? They have no oil, gas, coal diamonds etc. Think about it, if N Korea were somehow subdued. You suddenly have 23 million labourers who will work for appaulling wages much lower than their S Korean brothers and you don't have to care about their rights either. This is why US corporations love China, just look at the foxconn thing in China the Ipod factory where people kill themselves regularly. N koreans will be like S koreans post 1953 just happy to have survived and will work for absolutely nothing meaning bigger profits for likes of LG, Samsung and Hyundai. The boss of Hyundai and the Kaesong factory city aren't just for show you know. Thanks for this helpful summary. I am going to designate myself as TK's assistant to answer your questions. I hope he doesnt mind. The vast majority of Koreans don’t want a full-scale war with North Korea, as the consequences will outweigh the benefits. If you know history of Korea, specifically South Korea, it was one of the poorest countries in the world more than half a decade of ago. With hard work, dedication, and focus on education, South Korea has become one of the economic leaders of world, and engaging in a civil war with a militaristic country like North Korea will devastate South Korea’s economy; even a threat from North Korea negatively affects the KOSPI and Nikkei Index – equivalent of America's NY Stock Exchange – to a lesser extent. Engaging in a full-scale battle will not only set South Korea back 50 years, but the number of civilian casualties that may stem for SK simply will not be worth a full scale war effort. 2. If the two Koreas did go to war, how do you think SK would be affected after? As noted by many of the bloggers, SK has way more to lose than NK. Obviously, a civil war of this scale will yield tremendous amount of effects not only to Koreas, but to the entire region. But, for the purpose of the blog, we can focus on political and economic affects to SK stemming from the post Korean War II. Political: I don’t believe any changes will happen politically. China and Japan will probably stay status quo because NK stability neither impacts them positively or negatively. To China, NK is a failed socialist state where they have become too dependent on China for its survival, and Chinese government will want to engage with countries that have vested interest, like SK and Japan, to continue to spur growth to its nation. Economic: South Korea will experience negative growth for the next decade if the Koreas were to reunify post war. The mass exodus by NK refuges to major cities in SK will negatively result in massive spending by the government to accommodate millions or so refuges, especially to major cities. To make a analogous reunification event, after the fall of the Berlin wall Germany experienced negative growth for a decade because of the number of East Germans who migrated to West Germany to find jobs simply weren’t available. And Germany has a stronger and more robust economy than South Korea. By most economist estimates, it took Germany more than 10 years to arise from the negative growth due to the reunification with East Germany. Furthermore, Germany had assistance from European Union that certainly helped Germany recover at a faster rate than it had anticipated. Unlike Europe, though, East Asia doesn’t have a common union platform where neighboring countries will provide economic assistance. At least, I dont believe China and Japan will help as much as they TRULY can. Hopefully I am wrong, but dissension among China, Japan and Korea are still very deeply rooted IMO. One sector that would be positively affected by reunification is the civil engineering/construction sector. Right now, they have to look for projects in other countries because Korea doesn't need a lot of public works anymore. If NK opens up, then SK firms will jump all over infrastructure contracts. One of the main purposes for increasing tensions on the Korean peninsula was to apply pressure on Japanese Prime Minister Yukio Hatoyama to reverse course on moving the U.S. Marine Corps base off Okinawa. Hatoyama has admitted that the tensions over the sinking of the Cheonan played a large part in his decision to allow the U.S. Marines to remain on Okinawa. Hatoyama's decision has resulted in a split in the ruling center-left coalition government, a development welcome in Washington, with Mizuho Fukushima, the Social Democratic Party leader threatening to bolt the coalition over the Okinawa reversal. I had a class this last semester exploring this issue for awhile and two things have been bothering me since. Would you mind some clarification? I believe my Professor said that China would not try to help SK because it want's to take over North Korea and an official split between the two would be beneficial to China. Another thing I'm concerned about is what if NK makes an alliance with other nearby nations such as Russia in case of that full scale war? My memory has been hazy about some historical aspects of SK but if they did separate would china or corrupt border officials continue helping those who want to leave NK? There is the theory that China wants to take over North Korea, but I don't buy it, because China's biggest fear about the NK situation is the huge influx of refugees that would enter China if the current regime collapses. NK in the past had the support of the Soviet Union and China, so that's interesting that you mention some sort of alliance, but Russia probably would have nothing to gain from defending North Korea. That is what North Korea says about the latest incident. Here is an objective view on North Korea. Just so you guys know, if the war between SK and NK occurs Seoul, the Cap city of SK, turns into ashes in 7 min. I know this cuz I was in the army stationed Korea. Oh. SK will win the war for sure, but more than half of the population will die in less than a day.